A rainy Saturday morning allowed us a few hours to write a report of what we have been up to and what we are looking forward to this season. CSA Shares still available – sign up here – and tell your friends! Upstream Cider Community Supported Cider (CSC) shares available – sign up here! The past winter weeks have been spent investigating the harvest and planting records from the past season in preparation for 2017. March 15 we officially began our season by seeding our first trays of alliums (green onions, shallots, storage onions). What happens between the record reviews and the first seeds is the latent craft of farming. We make decisions about how much we want to grow, how much we want to bring to market, set sales goals for wholesale/retail accounts, and adjust varietal choices and plans from last year. When we begin discussing changes, we take into consideration things that did not work, things that work really well, comments we heard from CSA members, and new crops we may like to try. If we get to planning early enough we experience a much needed catharsis as we momentarily re-live the previous season and switch gears toward the dreams of another season to come. This season, we are trying to grow 1000 pounds of snap peas! (About half of which are already planted) We are going to expand our greens selection – growing more spinach and trying mache as a late season spinach alternative. Some of our favorite lettuce blends will be back, and we are going to experiment with growing individual varieties and blending them into salad mixes ourselves. Oren’s project crop is tigernut or choufa – a sedge grass that produces tubers that taste like almond. We’ve learned that horchata is made from tigernuts! With our new hot sauce due in the fall, we have expanded our hot pepper production – mainly the jalapeno and cayenne varieties. We are on target for plowing, planting and soil working so far and are looking for to our first harvests. In a whirlwind of logistics coordination and apple mash, about 600 gallons of cider fermented in 3 tanks from our October and November pressings. After 5 years of pressing, home fermenting and dreams of starting a cider company, the wheels have been set in motion. We pulled together about 10,000 pounds of apples from Future Fruit (Spring Green, WI), Ecker’s Orchard (Trempeleau, WI), Cattlena Ranch (Omro, WI), and Whitefeather Organics (Custer, WI). We have made a commitment to sourcing apples from orchards using organic practices. As we grow our production, we hope to encourage more orchards to begin the organic transition process by purchasing apples from new orchard areas under the mandatory 3 year transition from conventional to organic certification. For our 2017 batch, we have already connected with a family orchard in Poynette, WI who plan to sell us all of their apples starting this fall. Last year, they produced more than 40,000# of apples. The cider pressing process required some ingenuity and quick crafting. We built a second cider press out of a shop press frame, oak plywood, drain, and bottle jack. A local metal fabricator attached a pipe thread coupler to a steel milk bucket to make the flow of cider from press to tank a breeze. In one weekend we loaded, hauled, and unloaded 5 bins of apples, unpacked and set up our press work stations, ran the apples through, and filled 2 tanks with cider. Later in November, we ran a smaller batch. We sampled the cider a number a of times of the course of the winter and are excited about the taste – clean, crisp, dry, floral, a slight funk in aroma, and a light apple taste. In March, we bottled the first batch. We have two simple enolmatic vacuum wine bottle fillers. Cider went into 750ml (wine bottle size) bottles. Each bottle is capped and equipped with a flip-top cap, so you can reclose the bottle. We are looking into a bottle return program to reduce waste by reusing all the bottles. Cider shares are now available for purchase at upstreamcider.com – tell your friends & family! They will be delivered across the state in late May. We have also received approval to sell at the Stevens Point Farm Market this summer and plan to pursue sales at the Appleton Farm Market as well. Two upcoming events will feature our cider – April’s Bazaar After Dark in Kaukauna and June’s Holy Sheboygan show at the Draw (see details below). Options include every week and every other week pick up running through October OR November. We’ve added a Plover drop site this season at the Mission Coffeehouse on Post Road. We’ve also added an online full or 5-month payment plan option conveniently run through PayPal. Our plan for this season includes a few more greens (we’re excited to try a few spinach relatives! ), some fruits, fresh apple cider and loads of the standard fare (tomatoes, peppers, cucumbers, squash, onions). You can see the whole harvest list on our website. The first boxes this spring will boast both fresh cider we froze and stored over the winter and apple cider vinegar we fermented. We are also excited to be planting almost 50 peach trees and more than 100 plums this year. If you stick with us for 5 more years we’ll inundate you with fruit! (there will be fruits this year, but no peaches or plums). Hello Field Notes Farm Members! My name is Dan McDowell, and I’ll be working as the field manager for Oren and Polly this season. I come from southern Iowa, and I was raised in a gardening family. One of my earliest memories is of my parent’s huge raspberry patch and garden: something must’ve rubbed off along the way. 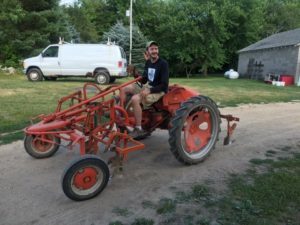 After graduating from a small Catholic college in Virginia, with a degree in philosophy, I began farming as an apprentice at Troy Community Farm in Madison in the 2016 growing season. In January of this year, my parents and I moved onto 35 acres near Amherst where we are starting a small produce, fruit, and grain operation, Rosebud Farm. When I’m not farming I’m reading good books, watching bad movies, fishing, or getting involved at St. Maximilian Kolbe Parish. You may be wondering how I went from studying philosophy to raising organic produce. My professor Dr. John Cuddeback farmed in addition to teaching, and from his lessons I discovered that I might want to make my living from the land. After detours into architecture and bookselling, I had to give farming a try. After one season, I was sold. I’m very grateful to Oren and Polly for the opportunity to work with Field Notes, and I cannot wait to learn as much as possible and to meet all of you! Howdy! My name is Danny Werachowski, and I’m very excited to be joining the Field Notes team this season. My interest in farming, gardening, plants, and soil was born of a need to shut my busy mouth after college and put my beliefs into practice. As a native of Custer and a resident of Stevens Point, I have a strong connection to the land and community around the farm. In my free time, I’m busy helping out with a number of organizations around town that address food issues, including Plant A Row, Food Justice Stevens Point, Giving Gardens of Portage County, and Farmshed. During the mornings, you can generally find me at the Main Grain Bakery folding, shaping, and baking sourdough bread. I enjoy evenings near the river with my bike by my side and a book in my lap. I’m also pretty big into playing and listening to all kinds of music, and have been happy to learn the other folks on the farm are musically inclined as well. I’ve been an amateur gardener for the last three years, growing in my own backyard and throughout the community of Stevens Point. I hope to build my skills in the years to come through dedication, persistence, and constant experimentation. Of all the opportunities offered to me by joining the team, the educational aspect is what I am most excited about. As the season progresses I hope to observe as much as I can and ask the same amount of questions. I’ll be at the Stevens Point Farmers Market every Saturday this summer on behalf of the farm – stop on down and say hey! Hello veggie lovers! My name is Monica and this summer will be my second at Field Notes Farm. At the end of last season, I made my way over to New Zealand and it has been an incredible trip so far! I’ve done some organic farming, lots of hiking, and met some very colorful people along the way. Although it will be hard to leave, I have a lot to look forward to back in Wisconsin. I’m excited to get back in the dirt and see what’s new this season at Field Notes! I’ve also discovered I love playing ukulele and writing little songs. I expect to have a lot of vegetable based inspiration this summer. In fall, I will be returning to UW Stevens Point as a dance major, which unfortunately means I will be missing those riveting games of catch the squash at the farm. But with so many fresh perspectives and experiences, I’m looking forward to getting back into school and the Stevens Point/Appleton communities! See you this summer! Field Notes Farm is happy to partner with Central Rivers Farmshed this spring! We rented space in the greenhouse in order to get our plants seeded and off to a great start. So far they’re looking fine and the onions have hit the ground running. We’ve been sharing space, knowledge, and resources with Moma Crow Farms of Appleton and Wooly Thyme Micro Farm. Since we’ve been in the greenhouse, Farmshed has updated the facility by installing ground cover on the West half of the greenhouse, hooking up a wash sink, and updating plumbing and electrical. Farmshed will be hosting a Plant Sale from May 25th through the 27th, an annual fundraiser spearheaded by the Growing Collective. We’ll be there selling grafted fruit trees, with a portion of the proceeds going to Farmshed. 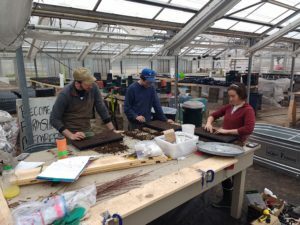 In addition, Farmshed’s Growing Collective will be selling plant starts, UW-Extension will be selling native plants, and Recycling Connections will be selling home compost bins and kitchen pails. It’s been great to share the space with and get to know the folks with Farmshed’s Growing Collective and Lonely Oak Farm, who are also renting space to start their own veggies. The greenhouse is bustling and we’re glad to be a part of the community utilizing the space provided. See you at the Plant Sale! Since her teenage years, she has been drawing and painting natural landscapes, native plants and insects. The works she will be creating for CSA members this season will be of wildflowers, pollinators, and fungi native to Wisconsin. Each work will be accompanied by with a brief intro about the species importance to the ecosystem, medicinal or culinary use, and/or history. The collections will help members connect to their local environment by recognizing the importance and role each species plays in the natural surroundings and our own lives. Lori has been a lifelong illustrator – drawing sketches alongside notes in school to the daily drawing and painting she does now. Her colorful and carefree work attracted our eyes as it works outside the bounds of typical art theory, shadows and perspectives. Over the course of the season, she will be creating illustrated recipes to accompany the CSA shares, and cumulatively they will create a cookbook that follows the seasonal flow of Central Wisconsin growing. We are seeking 10 workshare crew members this season. 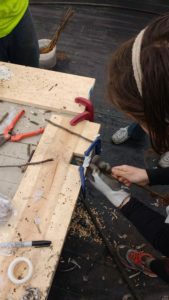 Our workshares contribute 6 hours per week for 16 out of 18 weeks June through early September in exchange for a full 22-week CSA share or 3 hours per week for 16 out of 18 weeks for an every-other-week share (11 boxes). Mondays and Fridays are our primary workshare days. Generally, workshare starts at 9am and goes to noon or 3pm. We have lunch on the farm Monday-Friday. The work includes harvesting, washing, and packing produce. Occasionally, we will also weed or plant. The experience is a great introduction to managing and harvesting vegetables on a commercial scale and wonderful excuse to be outside in the summer! Cooking lunch for the farm crew 2 days a week. This will include the produce share as well as food stuffs to create the meals. Driving CSA Shares – This will include picking up CSA shares at the farm around 1:30pm on Tuesdays and delivering them to Appleton or Stevens Point/Plover. You may remember Madeline’s charming smile and Forrest’s quick-witted tall tales from last year’s market stand. In 2016, they did their first growing for our market stand as Moma Crow Farm. Over the course of the fall and winter, we have worked with them to develop a more ambitious farm plan for 2017. Together, they are starting a 10-share CSA and bringing even more to market. They have a new tiller and a table full of starts in the greenhouse. Madeline will be managing our market stand in Appleton (as Oren and Polly bounce between our 3 markets peddling cider and occasionally taking a Saturday off). Forrest will also be helping at the stand and continuing to use his chef skills to cater small dinners at the Refuge and other venues in Appleton. After a few years off, I am back on the “food hub” train working to start a logistics and marketing cooperative. Working at the Stevens Point Area Coop for the last two years gave me insight into the buying side of local food. Why do we sell organic salsa from California when Drumlin Community Coop in Madison produces a great salsa? Well, how are we going to get Drumlin’s salsas to Stevens Point? Further, the local items we source through the distributors come at a hefty mark-up. Until recently, we were paying more wholesale for Blue Farm Blue Corn Chips out of Janesville then Woodman’s charges retail. The large for-profit middlemen have consolidated positions with one distributor often accounting for a majority of all products a small retailer carries. It is clear who has the power in this situation. The Small to Small Coop (S2S) will provide coordinated logistics and marketing services to small farms, processors, retailers, and restaurants. Small means under $250k for farms, under $1mil for processors, and under $5mil for retailers and restaurants (this last one is the government definition of a small business). We are developing a clustered distribution model that asks members to go the last mile (or first) to realize just-in-time aggregation and create a low margin service. We just applied for the Buy Local Buy Wisconsin Grant but plan to continue recruiting initial members and hope to get a van on the road before the summer. Let me know if you want to help organize this new cooperative! We have four people organizing so far but could use more help. A couple a beers at the Fox River House and a dinner at Town Council later and Julia, Polly, and I are entering into the hot sauce business with a line of fermented hot sauces. Field Notes CSA members will find a jar in their boxes this fall, we’ll take some to farmers’ markets in Neenah, Appleton, and Stevens Point, and we may even get some into grocery stores! Field Notes will grow the peppers, onions, carrots, and garlic and we’ll most likely make the sauce in the Farmshed kitchen here in Point. I returned to my hometown to speak to 8th graders about the career path of organic farming. The students were very curious with questions about getting started and how exactly it all works on 2 acres! Even my 8th grade science teacher was impressed. Both Oren and I look to support and encourage young people to start farming. One of the most important factors is just telling the story to young people that it is a viable option and a career path that fits many interests (being active, time outdoors, marketing in your community). This is the annual gathering of state Farmers Union members to discuss and vote on their policy. The membership of the union is broad and evolving – organic and conventional, dairy, beef, grain, vegetable, and livestock. Picture the House and Senate with lively debate about the future of agriculture and rural communities. Major topics of interest this year were non-partisan redistricting, the medicinal marijuana bill up in the Wisconsin legislature, r the re-birth of Wisconsin’s hemp industry, and antibiotic and GMO use. We discovered this group last season – a small, but diverse group of fruit growers from across the Midwest that spurs lively discussion on selling fruit, dealing with pests, managing fruitscapes and more. They have been a good resource for sourcing rootstock and scion, trialling ground covers, and tasting new fruit creations! Policy in action! Over 50 farmers from across the state take our organization’s policy to the state representatives and share our stories. We set-up meetings with house members and senators to discuss our stance and look for opportunities to put our policies on the books. The work was especially important this year with the biennial budget up for a vote. Last Saturday, 22 community members joined us in the Central Rivers Farmshed Greenhouse for a morning of grafting apple trees. We gave some background on fruit tree grafting, our story of learning the process, and spent most of the time practicing the “Shield Method” of whip and tongue grafting. Each attendee went home with an apple tree they had grafted. In addition to the class, Dan, Danny, and a few other community members have come to join us during our grafting work time. It has been beneficial for our own skill to teach others. It has certainly sped up the work of grafting 1300 trees — as of today we are closing in on the 1000 mark! In October, I purchased a duplex in Point situated just south of Downtown Stevens Point. The house, built in 1891, need a major kitchen overhaul, new electrical wiring, a refinishing of the floors and many aesthetic updates — all work that Oren, Ronan & I did ourselves! After 5 months of intensive renovations, one of the units is habitable and slowly becoming our cozy home (and office and project space). Because our farmland is rented, the space provides us with a stable home base for the coming years as we seek land for a future farm and home residence. The central location has provided convenient opportunities to socialize and spend time substitute teaching this winter. We have enjoyed (and been frustrated) by the process of getting to fix up our home the way we like! If I don’t seem busy enough I have decided to study law at UW Madison starting this September. In 2014, I got far enough along in considering law school to order a book of LSAT practice tests. Last winter I signed up to take the test on a whim and after scoring well I applied and was accepted to UW this last November. We have hired Daniel to account for my fall and spring absence and to help us continue improve Field Notes. I plan to continue farming May through the beginning of September annually and you will still catch me pressing cider on weekends! Tagged cider, CSA, farmers union, newsletter.